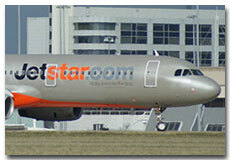 Jetstar Airways is a low cost airline of Australia with its main base in Melbourne, Australia. Jetstar Airways provides scheduled air flight operations to connect domestic cities with international destinations. It has come out to be one of the most famous airlines of Australia. Jetstar Airways is the regional associate of Qantas. You can easily book Jetstar Airways flight tickets reservations online here. Flights schedule and cheap flight tickets for Jetstar Airways are also available online now. Jetstar Airways was founded in 2003 as a subsidiary of Qantas and started flight operations in 2004. International flights operations started in 2005 with flights to Christchurch and New Zealand. Jetstar allows you to select your seat upon booking.